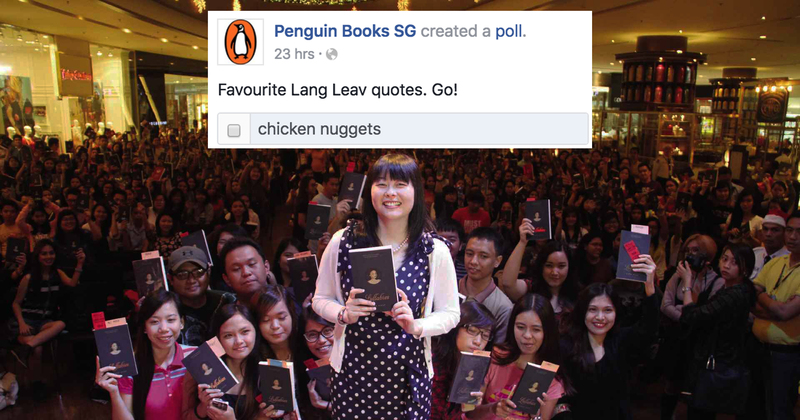 Poll Asks For Favourite Lang Leav Quote - Internet Chooses "Chicken Nuggets"
FB Poll Asks Netizens For Their Favourite Lang Leav Quote - Apparently, It's "Chicken Nuggets"
As promotion for Sydney-based poet Lang Leav’s (aka “the one who kinda got millennials to kinda appreciate poetry again…kinda”) book tour in Singapore, the local arm of global publisher Penguin Books decided to engage in social media to hype up her fans. A logical move, given that her readers are almost exclusively millennials or millennials at heart, with a penchant for passive-aggressively posting her poems on love and the loss of it on their Facebook walls and Tumblr accounts. And what better way to do so than to create a poll and get fans to vote for their favourite heart-wrenching, soul-crushing line? In theory, there were two positive outcomes from this – 1. Fans would be able to easily discover the choices of other fans, and won’t need to do so by asking around offline; 2. Lang Leav would get pretty useful feedback on which poem was on point, and which wasn’t. But as we all know, theory and reality are two separate entities. By the time I saw it on my Facebook feed, the poll (which allowed for users to submit their own options) was bustling with options – but as seen below, the top rated ‘quotes’ are obviously not from any of her works – save for one. and some trying their hand out at a little poetry themselves. Of course, while some of these options are just hilarious, there’s also the chance of potentially offensive posts, which had prompted Penguin Books to issue a comment urging contributors to ‘keep it clean’. 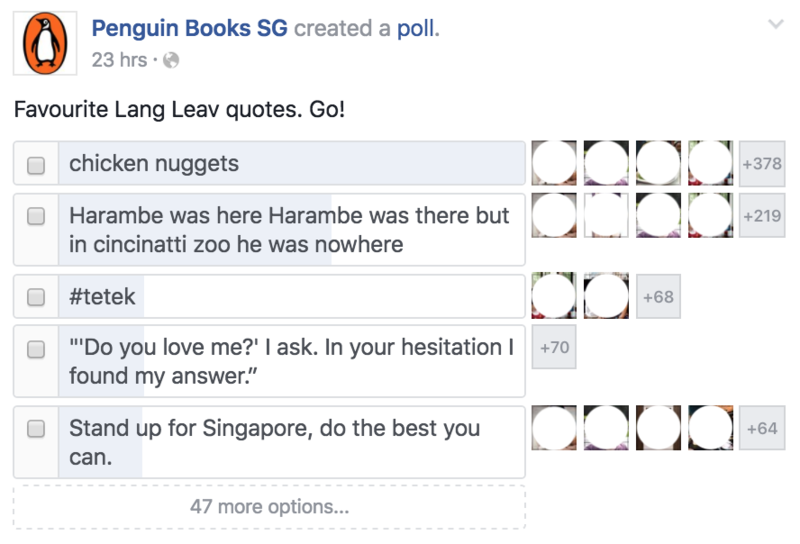 Although the poll didn’t exactly manage to get the intended purpose of finding Singaporean fans’ favourite Lang Leav quote, the event definitely got more social media buzz than if they had left the options fixed. No one really knows the true intention of the marketing team at Penguin Books SG, but if their intention was to get word of her tour out – it worked, for sure.